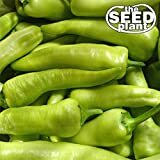 Sweet pepper growing shrub‎ of the genus Capsicum also known as Capsicum annuum, Sweet pepper perennial evergreen but can grow also as annual plant, can grow in tropic, subtropical, mediterranean, temperate or desert climate and growing in hardiness zone 10b+ as perennial 2+ as annual.. Flower color white cream or purple with 6 petals, the flowers small grow in clusters of 2-3 flowers. Fruit color can be: green, purple, yellow, red, orange, brown or crimson. Sometime Sweet pepper called Bell pepper but there are more varieties than one Bell pepper. 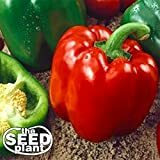 Hungarian Sweet Pepper Seeds, 100+ Premium Heirloom Seeds, ON SALE!, (Isla's Garden Seeds), Non Gmo Organic, 85% Germination, Highest Quality! 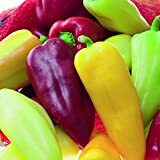 What can be done with big quantities of Sweet pepper fruits? 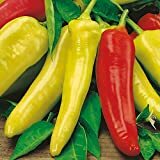 Jimmy Nardello – a delicious sweet red pepper from Italy. It is very suitable for drying and frying as it is for salads.